Last summer, we planted zucchini with high hopes of tackling a ton of great zucchini recipes. Anyone who plants zucchini always gets way more than they hope for, right? 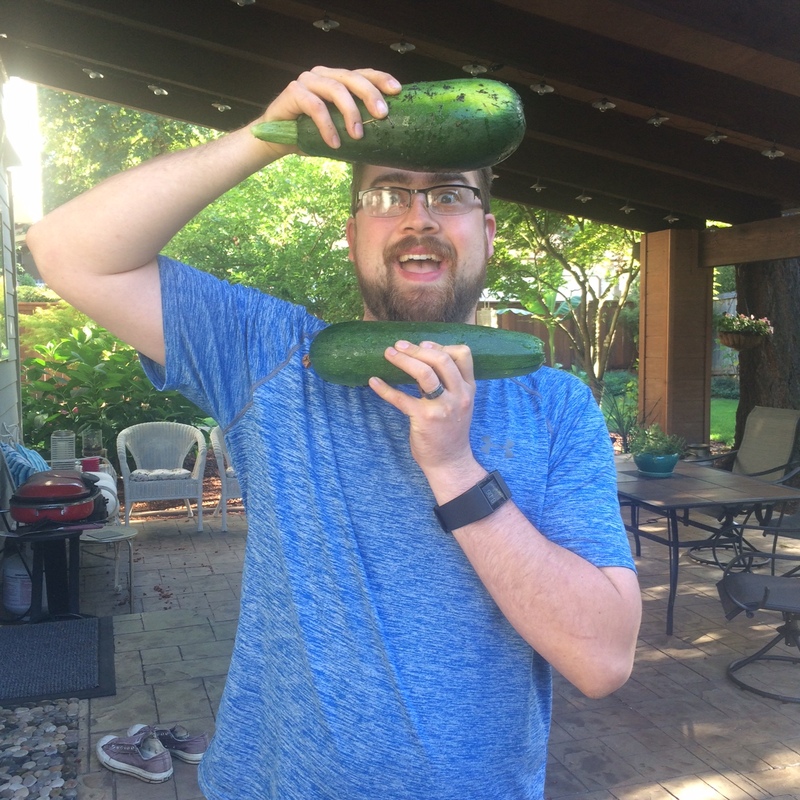 Nobody can screw up a zucchini plant! Well, apparently I can…our plant did nothing. Yet another blow to my gardening ego. We moved this year and planted more, seeing if history would repeat itself…and thank goodness we had some success! And of course, this summer I have been battling a pregnant aversion to certain vegetables, and zucchini was not as appetizing to me in healthy dishes like stir fry’s and zoodles. 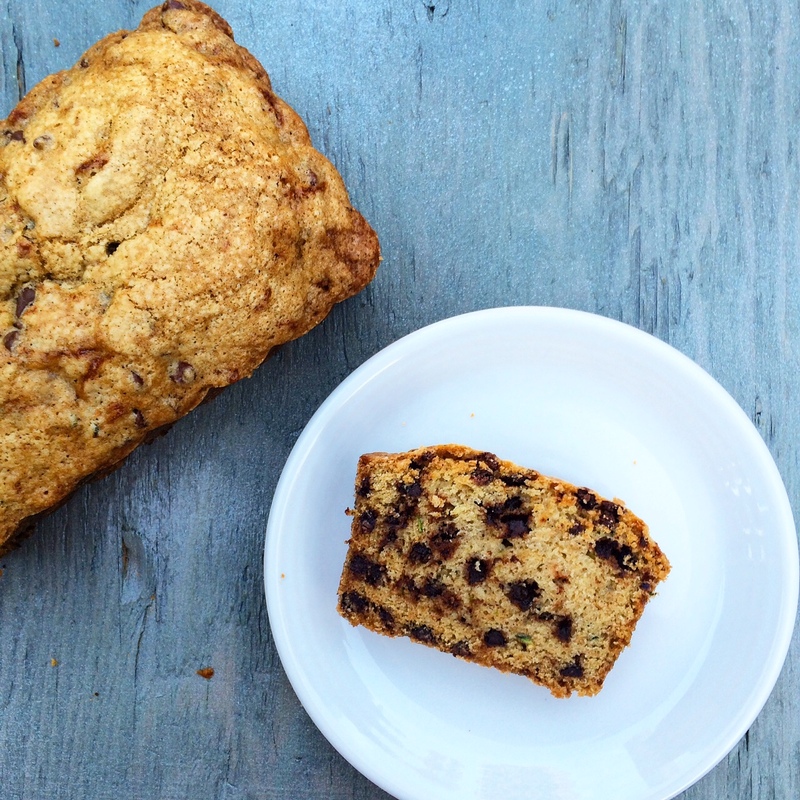 But luckily zucchini lends itself well to delicious baked goods, and finding a good basic zucchini bread recipe was first on my list! 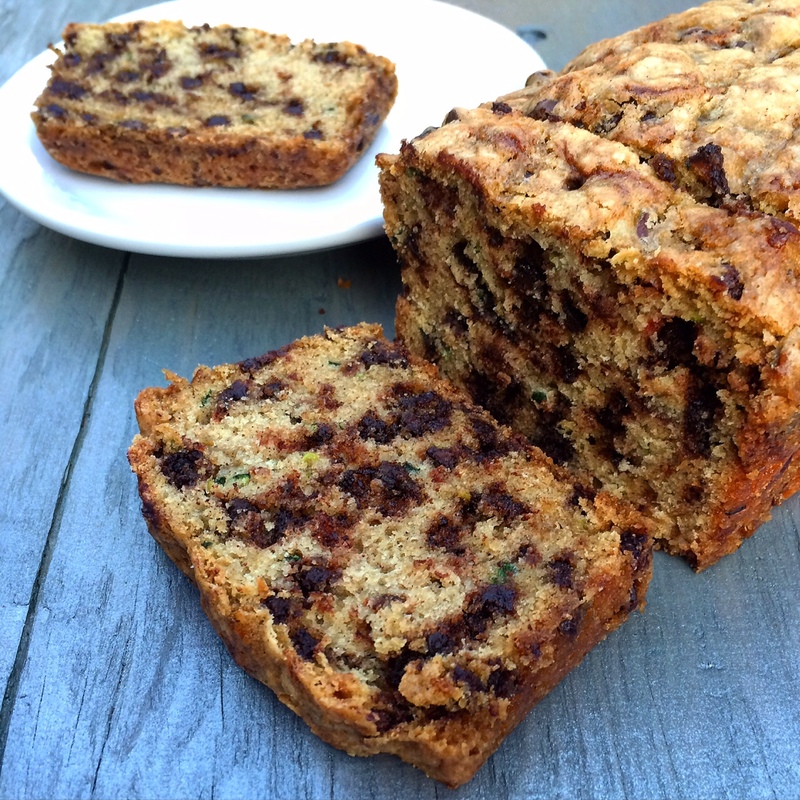 Of course, it had to be more than just basic zucchini bread…Tini Mini wanted it to have chocolate. See, I’m already blaming things on this baby! It’s not me that wants chocolate…it’s the baby. It’s not me that’s suddenly hating vegetables…it’s the baby! But hey, it seems like she has good taste so far, the bread turned out really tasty! 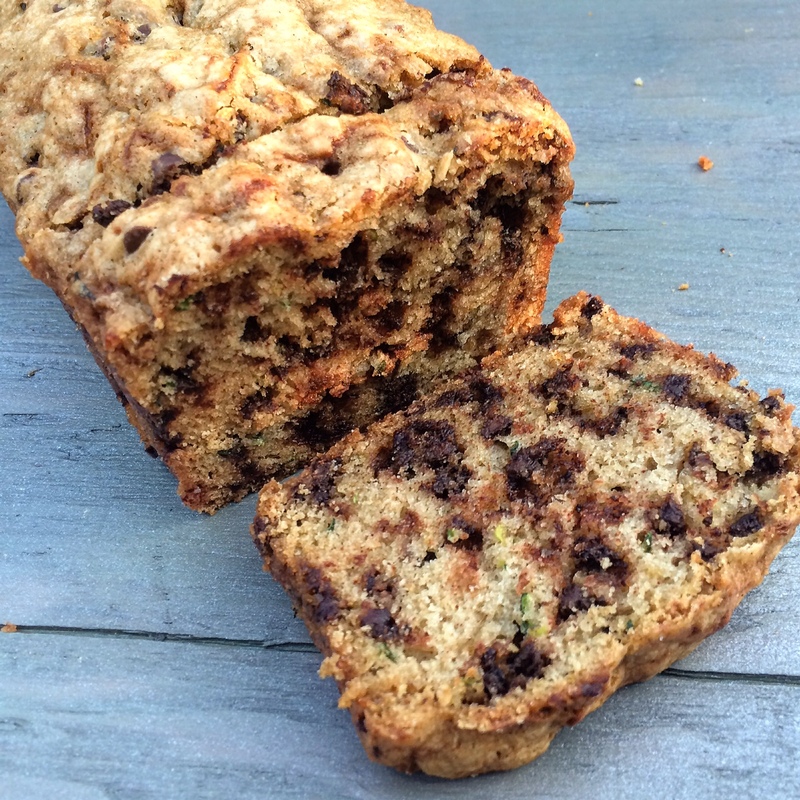 You can easily remove the chocolate chips from this recipe for a really good standard zucchini bread recipe. If you are adding chocolate chips, you may want to go easy on the nutmeg and cinnamon if you’d rather the chocolate shine through. It may not seem like enough batter, as the recipe only fills each loaf pan about halfway. But the bread rises quite a bit in the oven and the result is perfect sized slices of bread where you can pretend you are getting a day’s worth of vegetables in! Preheat oven to 350F. Grease the bottom and sides of an 8x4x2 inch loaf pan, set aside. (I used the disposable foil loaf pans). In a medium bowl, combine the flour, cinnamon, nutmeg, baking soda, baking powder, and salt. Set aside. In a large bowl, combine the eggs, sugar, shredded zucchini, vanilla, and oil. Slowly add the zucchini mixture to the flour mixture. Stir until moistened, the batter should be a little lumpy. Fold in the chocolate chips and the nuts, if using. Spoon batter into prepared pans. Note that this batter will only fill up the pans about halfway but the bread will rise! Bake for 50 to 55 minutes or until a wooden toothpick inserted near center comes out clean. Cool in pan on a wire rack for 10 minutes. Remove from pan. Cool completely on a wire rack. Wrape and store overnight before slicing.